Guelph, Ont. – The 25th Guelph Jazz Festival, focused on avant jazz and improvised music, began an eclectic program of concerts Thursday with a tribute to Sun Ra, setting the scene for five days of expansive and exploratory sounds. Musicians from nine countries are performing as part of the five-day festival in this city of 132,000, 58 miles west of Toronto. It has made its mark as a premiere showcase for music that draws fans from the U.S. and elsewhere in Canada as performers challenge conventions and celebrates new forms of expressions. 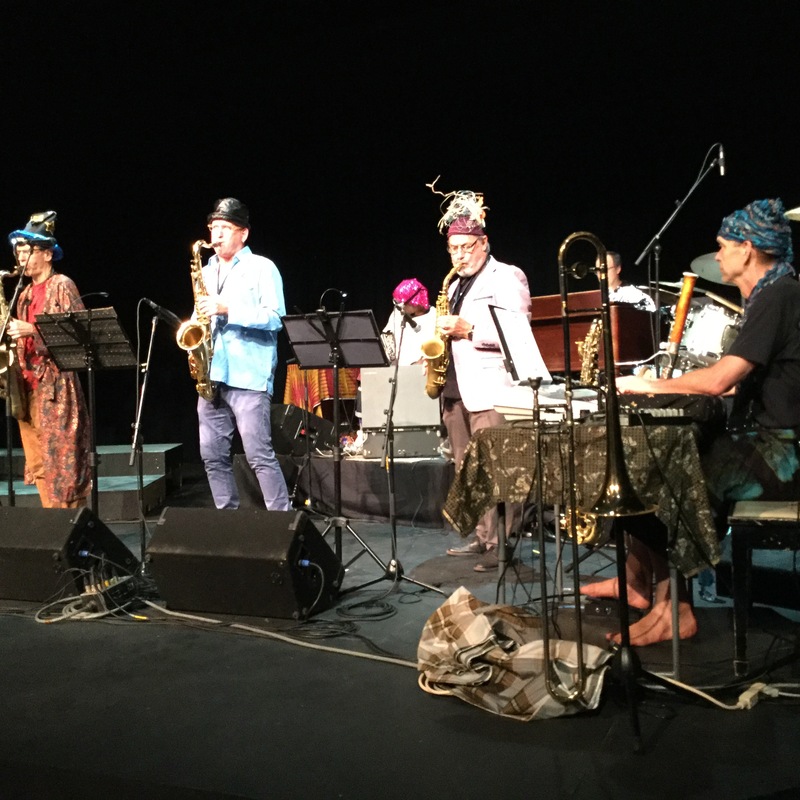 The opener featured the Ottawa-based septet called Sung Ra: The Rakestar Arkestra, and they came out with funny hats and off-the-wall outfits, playing the spacey, joyful, horn-driven and groove-laced music associated with Sun Ra’s cosmic and loving spirit. “Calling planet earth,” said one of the musicians, Sun Ra Style, as the band romped through a set, based on copies of his hand-written lead sheets. The ambiance was enhanced by the arrival of a 33-member massed choir of singers, including members of Toronto’s Element Choir, the Rainbow Chorus of Waterloo-Wellington, and other. Dressed in multi-colored and clownish outfits, they entered high-spirited from the back of the concert hall, chanting and vocalizing, as directed by Christine Duncan. It was a joyful well programmed revisit to Sun Ra’s world and the band was turned on, tuned in, and tight, with Rory Magill (keyboards, trombone), Don Cummings (Hammond B3 organ), Mike Essoudry (drums, clarinet), saxophonists David Broscoe, John Sobol, and Rob Frayne, percussionist Scott Warren. 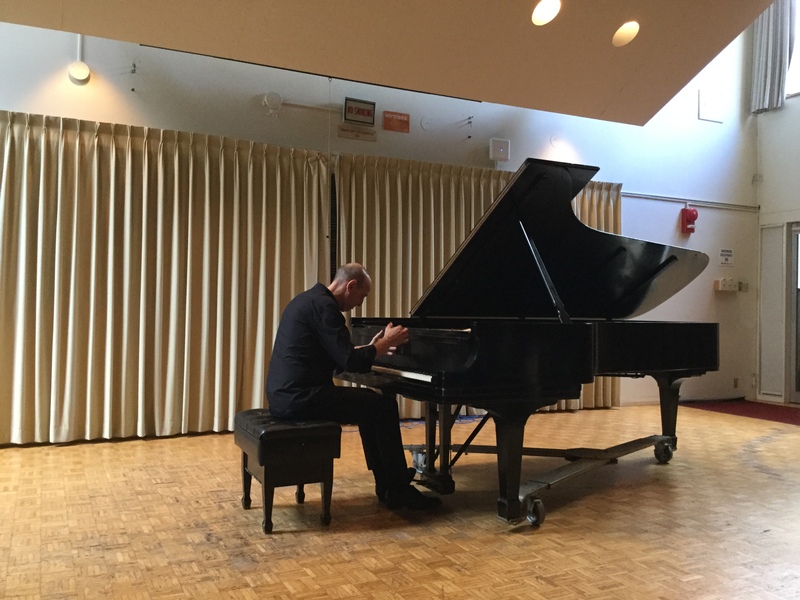 In the first of several free concerts, Barcelona-based pianist Agustí Fernández soloed at noon Thursday at the University of Guelph’s College of Arts, starting and ending by playing with silence, moving his long fingers in the air next to the Steinway, then tapping gently on the panel behind the keyboard, then touching the keys, slowly and deliberately, building his improvised program from there. It was a succession of fragments that added up to a meaningful and pleasurable whole. His use of various objects in his “prepared piano” to alter the sound gave his music internal and external combustion. He even moved to the back of piano to strum and pluck the strings inside the box, to get that “outside the box” sound and texture. His music is both muscular and ethereal, yet lyrical and intense, a sound sculptor with a powerful keyboard attack. He ended as he began, fingers moving in the air, silently – an early festival highlight. The quartet led by Toronto drummer Nick Fraser, featuring U.S. saxophonist Tony Malaby, kicked off Thursday evening’s double bill at the River Run Centre concert hall. The band has played together for five years and, having heard them in Montreal shortly after they began touring, can testify to their growth as a cohesive unit. They play Fraser’s original and challenging charts and improvise with hearty gusto. When there is more of a groove, they make the earth move. Among highlights: Fraser’s constantly varying rhythmic leadership, well-crafted solos by cellist Andrew Downing, and Malaby’s free-wheeling and colourful soprano sax. New-York based Amirtha Kidambi, vocalist, composer and multi-instrumentalist, was the follow-up with her Elder Ones quartet, which features her politically-acute themes. She sat behind and played the harmonium – the small keyboard instrument with hand-pumped bellows used in a style of traditional South Indian singing. That sound, and her vocals and vocalizing, are delivered powerfully with her tightly knit unit of propulsive drummer Max Jaffe, saxophonist Matt Nelson, and bassist Nick Dunston. Her message is all about music, not agitprop. We heard Kidambi’s emit such lines such as “Eat the Rich” and “from darkness into light,” but the music told the real story. Her musical meditation on “untruth” – “in the U.S. truth is a very slippery slope” – made the audience feel what she described in words as living in threatening times. It was an electrifying set. Friday’s program began at the main square of the University of Guelph, where Montreal-based singer, composer and multi-instrumentalist Thanya Iyer offered a set that again reflected Indian musical traditions, with breathy vocals supported by drummer Daniel Gélinas and bassist Alex Kasirer-Smibert, who also provided an electronic soundscape – perfect for a sunny afternoon. Two free concerts at the Silence performance space captivated a standing-room crowd in the early afternoon. Montreal-based electric guitarist Bernard Falaise, with a range of pedal effects, delivered an extraordinary display of extended techniques in his improvised gig. He gave that guitar an orchestral dimension, extracting from it a variety of sounds, using various devices and both hands to produce clicks, tones, bells, scratches, note bending, and microtones that sounded exotic and exciting, adding up to a convincing musical work. 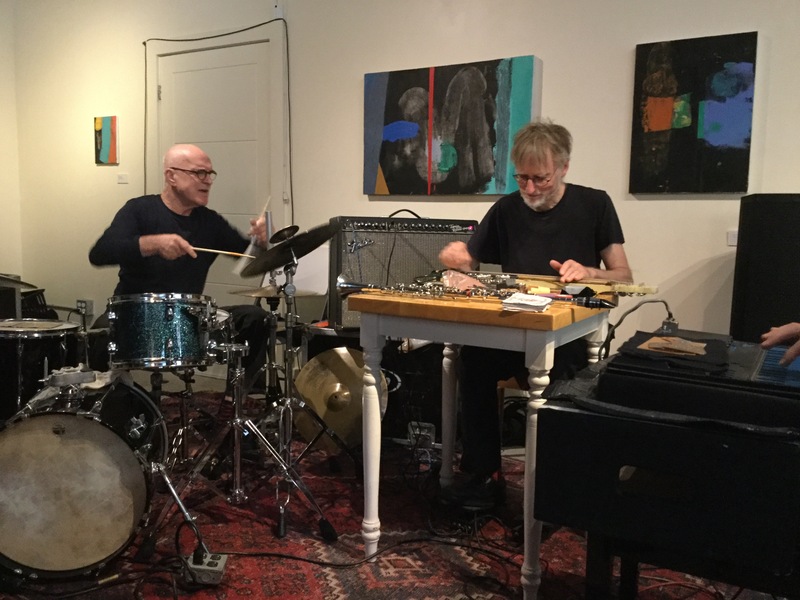 Improvised music in a trio came next with Konk Pack – British improvisers Tim Hodgkinson (ex Henry Cow) on lapsteel guitar, clarinet, and electronics, drummer Roger Turner, and Germany’s Thomas Lehn on analogue synthesizer. They started quietly in a three-way conversation and developed form there, in a musical language of their own spontaneous creation. They engaged the listener with unexpected twists and turns, and turned it into a pulsating and fun ride. More on the festival in the next days.